This afternoon has indeed been very interesting. There’s water outside, fallen from the sky, and it makes everything wet. Normally it might be fun to play in, but the sky flashes and the sound of something terrible fills the air. Everything is okay though, as my buddy is here to keep me safe. He sits on his bench, playing the old piano. 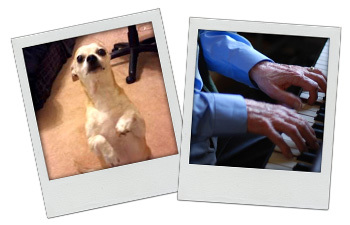 On occasion, I too find myself hitting the keys with my paws in an attempt to mimic my old friend, but it never comes out quite right. Today, I do not join him on the bench though, as I’ve found a nice spot below his feet so that I can hear his breathing and familiar heartbeat, assuring me that he is close. In his years, my old friend has seemingly lost a bit of touch with his own paws, their agility seemingly becoming less steady, just like his heart. But he continues on, like nothing else bothers him. He’s a tough guy, still thinks he can do everything on his own, but I can tell he’s having trouble. This comes especially to mind when I think about my own daily needs. He can’t exactly run like I can, and even though he picks up a third leg to help him, he still has trouble keeping up with my four. Aside from getting into mischief, I am really a good pup. 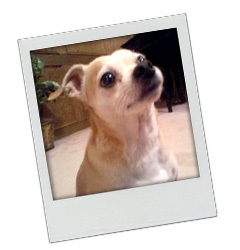 We can never forget those that represent the everyday dog-life, such as our four-legged friend, Rocky the Chihuahua. These tales tell of Rocky’s adventures with his companion, and while fictional, are actually based on the everyday events that this clever pup enjoys. And you’d be surprised at what dogs can really get away with when you spoil them. In real life, Rocky is a rescue dog. Rescued from a lovely “no kill” animal shelter in West Texas, Lone Star Sanctuary for Animals, Even there, he was a local personality who loved sleeping in cat and dog piles! Enjoy a different outlook on the world through a dog’s eyes as Rocky interacts with companions and friends alike. Rocky is definitely mischievous in real life, and definitely shines as a bit of entertainment for the everyday dog lover. Perfect practical tips for any dog parent of any age, at any stage of your dog's development. © Copyright 2013 City Dog Tails. All Rights Reserved.